Michael van Gerwen will enter the play-offs as the league leader having already sealed top spot in the table for the sixth consecutive season. Mighty Mike produced his best performance of the Premier League season last week when he dismantled Rob Cross 7-2 – he averaged 111.57 in doing so. Last weekend at the European Darts Grand Prix, he recorded a tournament average of over 107 on his way to lifting the trophy – that was Van Gerwen’s 10th tournament win of 2018 so far. Gary Anderson comes into the match having lost in each of his last two Premier League matches, but in spite of that he has all but confirmed his place in the play-offs. He is two points ahead of Daryl Gurney and is 12 legs better off than the Northern Irishman on legs difference so it would take a dramatic turn of events for Anderson to miss out. Anderson could still have a chance to move up into third place in the table should Rob Cross fail to defeat Simon Whitlock earlier in the evening. A third-place finish would avoid another clash with Michael van Gerwen in the semi-finals at the O2 next week. Michael van Gerwen and Gary Anderson often serve up some unmissable action when they face-off on the oche and this match could be no different. When they met back on night three of the 2018 Premier League, they both averaged over 110 in a match won 7-3 by Van Gerwen. The irrepressible Dutchman has been in scintillating form over the past week; he averaged over 111 in dismantling Rob Cross last Thursday night and followed that up by storming to victory in the European Darts Grand Prix where he averaged over 109 in his quarter-final, semi-final and final. 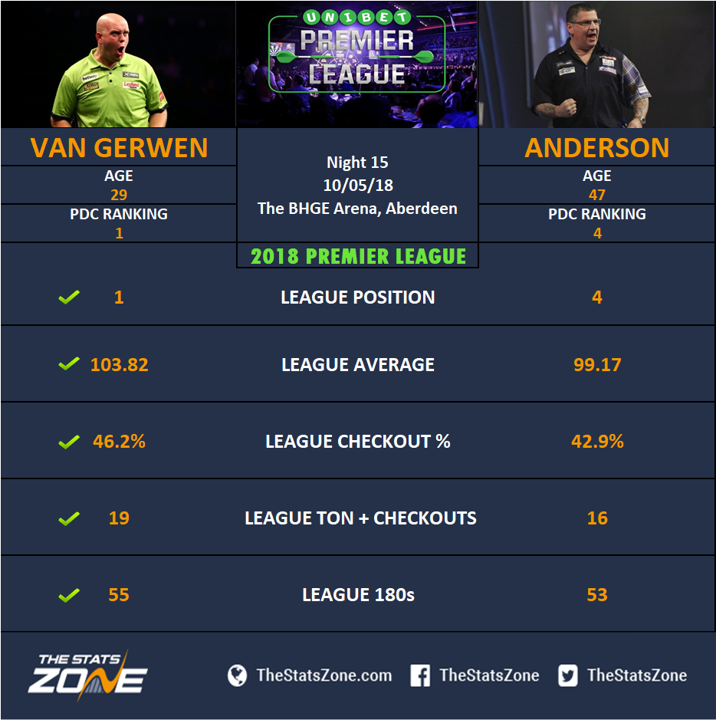 Anderson is capable of hitting those heights but just not as regularly as Van Gerwen and it is for this reason that Van Gerwen is tipped to come out on top in this high-calibre tussle.